A few weeks ago I was accosted by one of those vendors in the mall. I really hate shopping as it is, but when some random guy grabs your arm and starts slathering something on your hand, it makes me only want to online shop from now on. He put some sort of exfoliating gel on and started rubbing it in. As I tried to get away, he explained that he was pulling out all the dead skin cells. (He even looked at my hand and said something like "When's the last time you showered...?") When he washed it away (after an intense and awkward hand massage), there was an INCREDIBLY noticeable difference between my hands. He then tried to sell me the exfoliant and a lotion for upwards of $100. When I refused he wanted to give me a "special" deal for $70 or so. I work in marketing and sales. If you can jump down that much in price, it must not be worth anywhere that much. Anyways, the rest of the day (and next morning) I could still see a major difference in my hand. I honestly don't exfoliate. I have sensitive skin that tends to be dry so I spent so much time finding the right lotion, that I haven't spent any time or effort taking off a layer of my skin. I didn't want to spend a fortune or scrub unknown chemicals into my skin, but I couldn't get over that difference in my hands. I did some research online and found a simple and natural skin scrub that takes away dead skin cells, but leaves your skin feeling like butta. I've been doing this once a week and noticed that I have less blackheads and my skin is actually less irritated. It's my fave and costs next to nothing to make at home. I usually throw my coconut oil in a small bowl or mug and nuke it in the microwave for 20 seconds to melt it. Then I mix the sugar in and massage it on my face for 60 seconds. I wash it off with warm water and a washcloth. 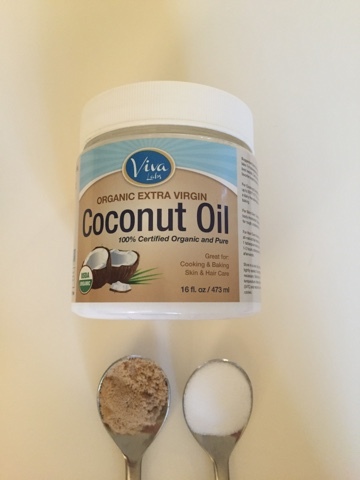 The sugar is a great natural exfoliant and the coconut oil leaves your skin silky smooth.